Ladies and Gentlemen, thank you for coming. Today we are presenting to you one of the OECD’s most important assessments: our new study on inequality and its main causes. The title of this book - “Divided we Stand: Why Inequality Keeps Rising” -reflects very well the importance and urgency of this ever-growing policy challenge. The situation has worsened during the last years. Income inequality in OECD countries is at its highest level for the past half century. The average income of the richest 10% of the population is about nine times that of the poorest 10% across the OECD, up from seven times 25 years ago. In some countries, inequality has increased further from already high levels; that is the case of Israel and the United States. Other traditionally more egalitarian countries, such as Germany, Denmark and Sweden, have seen the gap between rich and poor expand from 5 to 1 in the 1980s, to 6 to 1 today. Only a few countries have managed to buck this trend: income inequality has recently fallen in Chile and Mexico, but in these two countries the incomes of the richest are still more than 25 times those of the poorest. A sustained period of strong economic growth has allowed emerging economies to lift millions of people out of absolute poverty. But the benefits of strong economic growth have not been evenly distributed and high levels of income inequality have risen further. Among the dynamic emerging economies, only Brazil managed to strongly reduce inequality, but the gap between rich and poor is still at 50 to 1, about five times that in the OECD countries. Sustained inequality inhibits growth and social cohesion. It is a real “live” economic issue as we could observe at the beginning of the crisis when the housing bubble burst, and the most vulnerable couldn’t afford to pay for their mortgages anymore. The framework and the incentives which made this happen had its roots in deep-rooted social imbalances. Furthermore the economic crisis has added urgency to the need to address inequality. The social compact is starting to unravel in many countries. Uncertainty and fears of social decline and exclusion have reached the middle classes in many societies. People feel they are bearing the brunt of a crisis for which they have no responsibility, while those on high incomes appear to have been spared. Addressing the question of “fairness” is a condition-sine-qua-non for the necessary restoring of confidence today. To reverse this trend we need to identify the causes. Our report Divided We Stand aims to untangle the complex web of factors behind the widespread increasing trend in income inequality and puts forward new recommendations on how to curb it. The single most important driver has been greater inequality in wages and salaries. This is no surprise: earnings from work make up about three-quarters of total household incomes among the working-age population in most OECD countries. Why have wages become more unequal? The labour markets of all countries have gone through profound transformations driven by globalisation, technological changes and policy reforms. For example, technological progress has clearly been a key motor for economic growth; but highly skilled workers have benefitted much more than others. People with skills in high demand - in information and communication technologies or specific to the financial sector, for instance - have enjoyed significant earnings and income gains, while workers with low or no skills have been left behind. The increase of top incomes is also the result of companies operating in a global market for talent, as well as of a spectacular rise in bankers’ and top executives’ pay, and of the emergence of a “winner-takes-all” culture in many countries. Labour market outcomes have also been significantly shaped by policy and regulatory reforms, both in the markets for goods and services where competition was strengthened and in labour markets, which were made more adaptable. At the OECD, we have provided ample evidence that these reforms have promoted productivity and economic growth and brought more people into work, in particular many women and low-paid workers. But the logical consequence of more part-time and low-paid workers is a widening distribution of wages. Moreover, the distribution of non-wage incomes, and especially capital income, has also become more unequal. However, at around 7%, the share of capital income in total household income still remains modest on average and its impact on overall inequality is therefore limited. We need to refocus our policies. Our study argues that the most promising way of tackling inequality is, more than ever, to foster the employment of under-represented groups. Creating more jobs – and especially more productive and rewarding jobs – which enable people to escape poverty and offer real career prospects, is the most important challenge. Investing in human capital is essential to promote employment and employability, and to tackle inequality. Indeed, our report clearly indicates that up-skilling of the workforce is by far the most powerful instrument to counter rising inequality. The investment in people must begin in early childhood and be followed through into formal education and work. This is vital to ensure equality of opportunity for children from disadvantaged backgrounds. Human capital investment then needs to be sustained over the working life. The way that training is provided also needs careful assessment and both employers and individuals need the means and incentives to invest in human capital. Reforming tax and benefit policies are also measures that can promote a better distribution of income. Tax-benefit systems have become less effective at redistributing incomes over the past decades. The main reason for this declining redistribution is on the benefit side: levels were cut and eligibility rules tightened to contain social spending, and transfers to the lowest income groups failed to keep pace with earnings growth. Over the last two decades, there was a move away from highly progressive income tax rates and net wealth taxes in many countries. As top earners now have a greater capacity to pay taxes than before, some governments are re-examining their tax systems to ensure that wealthier individuals contribute their fair share of the tax burden. This aim can be achieved in several different ways. They include not only the possibility of raising marginal tax rates on the rich but also improving tax compliance (and in this areas we have been helping governments eliminate bank secrecy and fiscal havens), eliminating tax deductions, and reassessing the role of taxes on all forms of property and wealth. Another important instrument especially for emerging economies is the provision of high-quality public services, such as education, health, and family care. On average, OECD governments spend as much on public social services – some 13% of GDP – as they do on all cash benefits taken together and this spending reduces inequality by about one fifth on average. Ensuring equal access for all to such services is a challenge in many emerging economies, but it is of critical importance in order to reduce inequality and provide equal opportunities of personal and professional development for all citizens. This takes me to my last point, the regional dimension of inequality. As I mentioned this morning in the presentation of our new Regional Outlook, regions can be powerful engines of growth and convergence. But they can also “grow lagging” or fall behind in these difficult times. Reducing regional disparities must come back to the top priorities of policy-makers. Regional cohesion must be at the very centre of our recovery efforts. The OECD is also ready to help on this front. The benefits of economic growth DO NOT trickle down automatically. This study dispels this assumption. Greater inequality DOES NOT foster social mobility. Without a comprehensive strategy for inclusive growth, inequality will continue to rise. There is nothing inevitable about high and growing inequalities. Our policies have created a system that makes them grow and it’s time to change these policies. Our report Divided We Stand provides powerful evidence of the need to “Go Social!” We need to put “better policies for better lives” at the centre of our policy efforts, while providing people with equal opportunities and hope. Income redistribution should be at the core of responsible governance. 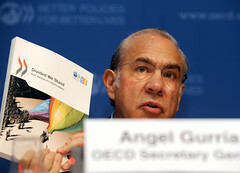 The OECD stands ready to support its member and partner countries in achieving this objective. Tackling inequalities continues to be our core business for economic reasons, for fair societies with equal opportunities, and not least for the well-being of our citizens!